Hello! 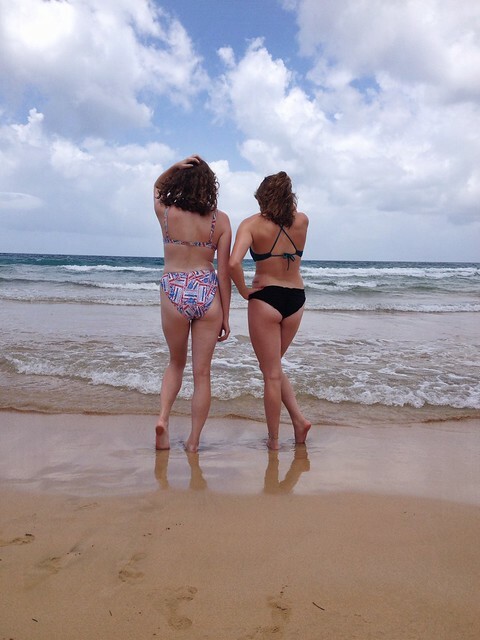 Last week, my family and I jetted off to Puerto Rico for a relaxing week spent lounging on the beach, taking in the sun and forgetting our worries. I snapped plenty of photos on the trip and wanted to share a few of my favorite outfit photos with you all. My aesthetic for the week was beach-y, retro free spirit. 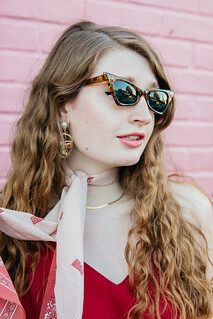 I relied on bold cat-eye sunglasses and lipstick to keep me stylish while there, ditching my hair products and eye makeup for ease. I snatched these floral adorned cat-eye sunglasses from my sister's wardrobe a couple weeks ago and I haven't wanted to take them off since. 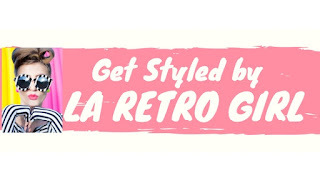 I love the feminine, 1950's feeling that they have to them. Just peachy! For this look, I slipped on a tropical floral printed dress. 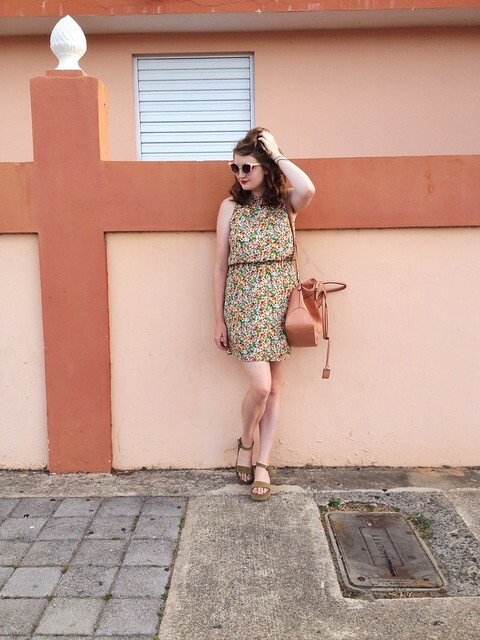 Breezy printed dresses were my go-to while in Puerto Rico as they were the easiest, stylish option. Besides the fact that they didn't take up much room in my suitcase! 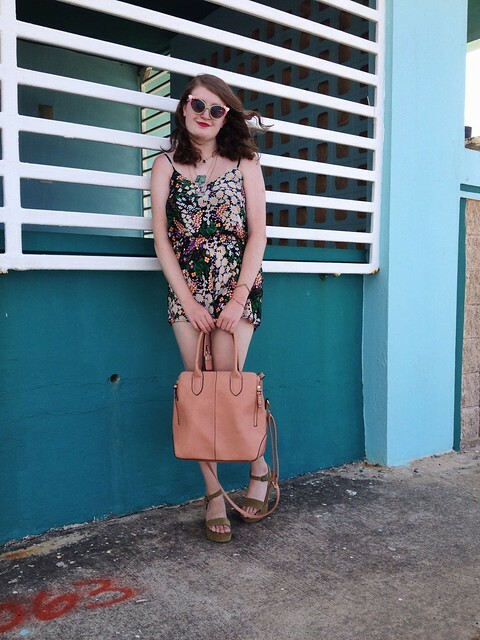 I styled this dress with a pair of flatforms, golden bracelets, a peachy tote bag, red lipstick and retro sunglasses. Posing for a quick photo with my sister on the beach in my vintage, high-rise Budweiser bikini. Colorful, textured walls and mod architecture fill Puerto Rico with a carefree, tropical feeling that reminded me of what 1950's/1960's California and Hawaii would have been like. This unique landscape of cheery structures was one of my favorite things about Puerto Rico. I couldn't help snapping plenty of photos against the vibrant walls like the one above. 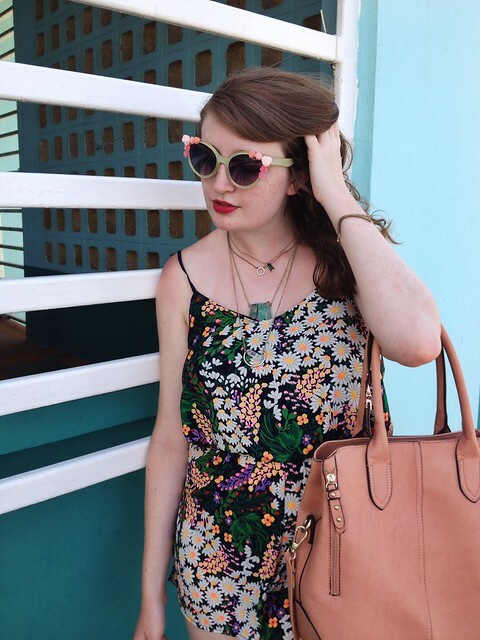 The details of this look make it my favorite look of the week; all the details effortlessly complement each other perfectly (swooning over the way the flowers on the sunglasses highlight the floral print of the romper!) Additionally, I can't help but love how the combination of soft colors and statement pieces creates a retro, feminine feeling. 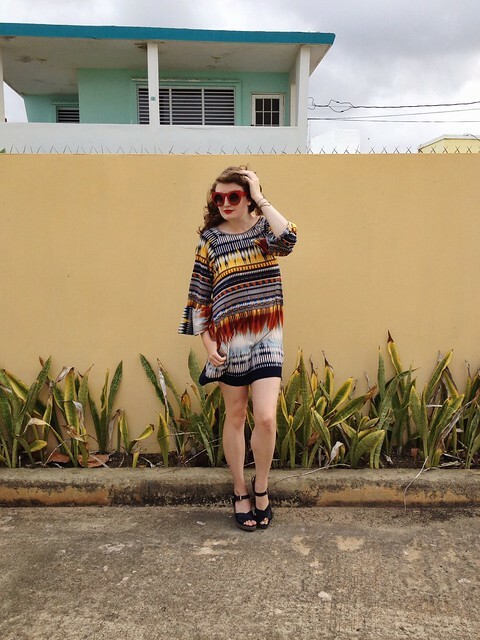 Yes, yes and yes to the flared sleeves and vibrant print of this dress. 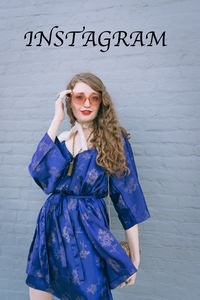 I styled a pair of navy wedges, golden bracelets and a pair of bold red shades with this look to create a statement. 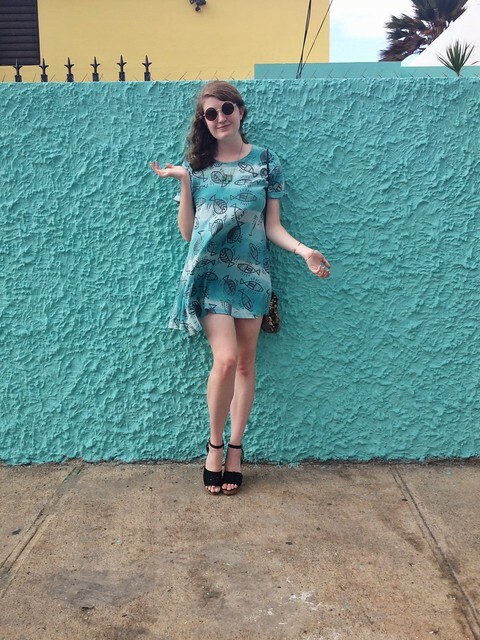 Shout-out to the wall by the condo we were staying at for accentuating my outfit perfectly! I've been lusting after American Apparel's collection of swimsuits for seemingly ever now so I decided to go ahead and purchase one before my trip to Puerto Rico considering I would be spending over half the week in just my bathing suit. And I think this may be by far the most flattering swimsuit that I have ever owned. Even better yet, I scooped it up for half off for only $25! This dress is so beautiful. You look stunning!